A new music variety show pairing up Korea's best musicians for collaboration has gotten off to a good start on a weekly television chart, data showed Wednesday. "The Call," which premiered on May 4 on the cable channel Mnet, ranked No. 6 with a score of 223.1 on the weekly Content Power Index (CPI) for April 30-May 6. Created by the production team of the hit show "I See Your Voice," the format of which has been sold to multiple countries, the new show matches up outstanding musicians with different styles and colors to produce a song together and create the best collaboration. Singers Shin Seung-hun, Kim Jong-kook, Wheesung and Kim Bum-soo got to offer a call for desired music partners and eventually teamed up with Ailee, BewhY, Hwang Chi-yeul and Taeil of the boy band Black B, respectively. "Fly Away," composed by Shin Seung-hun and sung together with Ailee, has received an especially positive response from audiences. The song has performed well on local online music streaming sites. As seen on other music shows, a song makes or breaks a music variety show, regardless of its format or concept. 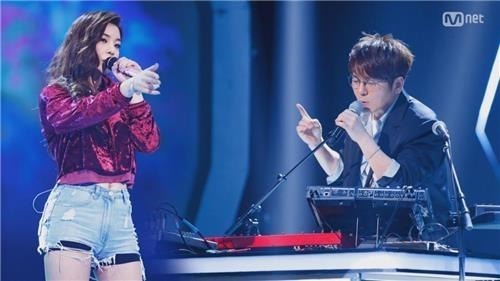 KBS 2TV's "Hyena on the Keyboard," which had suffered from disappointing viewership ratings of less than one percent, bounced back strongly with the hit song "Don't Give It To Me" by singer-songwriter and rapper Loco and Hwasa of the girl group Mamamoo. Meanwhile, the top post was taken by MBC's "Point of Omniscient Interference," which features stars and their managers and gives a peep into the stars' private lives. It garnered a score of 232.8.